My family has been following the Women's World Cup very closely. We're all huge fans of the US national team and have whooped and shouted ourselves hoarse watching their recent games. Seeing the size of the crowds at these games, it's no wonder that EA Sports has finally announced that women's teams will be included in FIFA 16, due out in September. 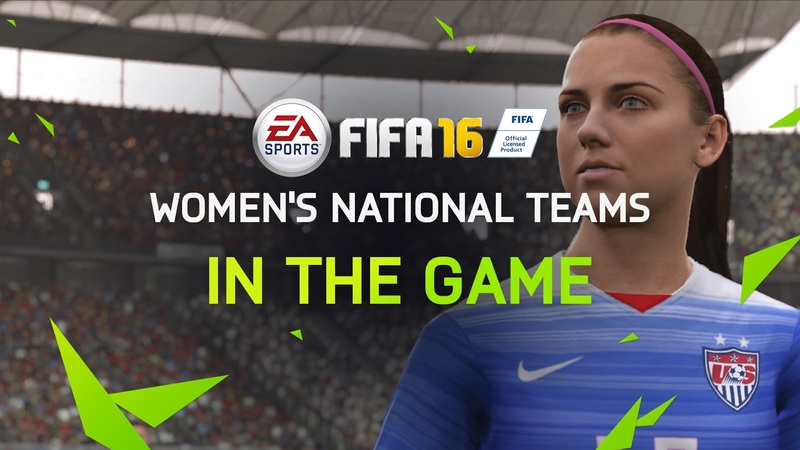 In more than twenty years, no FIFA game has included any women's teams. The decision, announced in late May is a huge relief for many fans of the series who have been clamoring for the inclusion of the hugely popular Women's Leagues. Twelve national teams will be available for play in Match Day, Kickoff and offline Tournament modes: USA, Canada, Australia, England, Germany, Brazil, China, Mexico, Spain, Sweden, France and Italy. It's a small selection, but EA Sports appears to be testing the waters, waiting to see how successful the addition is before committing to more content. I am disappointed that there aren't more teams available even though I understand EA's position. There aren't any national leagues like the USA's NWSL or Germany's Frauen-Bundesliga. Even just a few more national teams would have been nice. Even just rounding out the teams that made it to the group stage of this year's World Cup would have been a more substantial offering. More disappointing, however, is without these national leagues there is no women's Career Mode. As much as I may sound ungrateful for what EA Sports is giving us, it is a very important change to note. I have no doubt that the inclusion of these teams will boost the sales of FIFA 16 significantly. When that happens, I hope EA responds appropriately and either adds more content in the next release or, preferably, adds more teams and/or modes via DLC. I'd love to build my USA dream team in Ultimate Team mode. Now, can we talk about putting a woman on the cover?